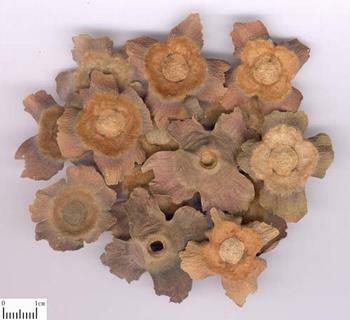 The calyces of Diospyros kaki Thunb. Sichuan, Guangdong and Guangxi provinces in China. Collected in autumn and winter when the fruit is ripe. Bitter and bland; stomach meridian entered. Direct qi downward to stop hiccup. It is bland in nature and good at directing stomach-qi downward, so it is indicated for hiccup due to adverse rising of stomach qi. For hiccup due to stomach cold, it is usually combined with the herbs of warming middle energizer and checking adverse rise of qi to stop hiccup. For instance it is combined with Ding Xiang and Sheng Jiang in Shi Di San from Ji Sheng Fang. For hiccup due to deficiency-cold of spleen-stomach, it is combined with the herbs of tonifying qi, warming middle energizer and checking adverse rise of qi. For instance it is combined with Ren Shen and Ding Xiang in Ding Xiang Shi Di Tang from Zheng Yin Mai Zhi. For hiccup due to stomach heat, it is combined with the herbs of clearing heat from stomach and checking adverse rise of qi to stop hiccup such as Lu Gen and Zhu Ru. For hiccup due to phlegm-damp accumulation, it is usually combined with the herbs of resolving dampness and checking adverse rise of qi such as Xuan Fu Hua, Dai Zhe Shi and Ban Xia.